You won’t find Maxwell Benson on Twitter. You won’t find him on Instagram. In fact, if you walked right past him on the street you wouldn’t even know you just encountered the music producer who is ready to lead a Hip Hop revolution. 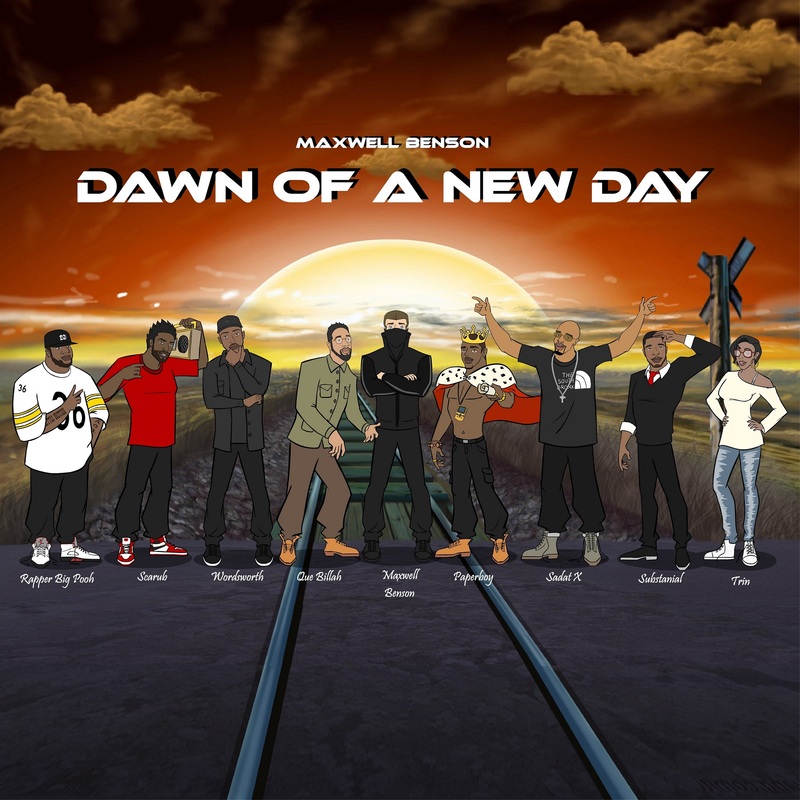 Benson is set to transform from mild-mannered beatmaker to superproducer rap savior with his Dawn Of A New Day album featuring performances by Brand Nubian’s Sadat X, Little Brother’s Big Pooh, Living Legends’ Scarub, Substantial, Wordsworth, Paper Boy Prince of the Suburbs, Que Billah and Trin. The 8-track EP will drop online on August 11 commiserating the day the culture was birthed 40 years ago at DJ Kool Herc’s legendary party at 1520 Sedgwick Avenue in The Bronx. DZI: The Voice caught with Maxwell Benson to discuss the new project, why he keeps his identity a secret, his views on mainstream Hip Hop, and more. Maxwell Benson: I think I must have been around 6 years old. I went to our local pizzeria and for some reason beyond me they were handing out 45’s (vinyl records) with some kind of Italian song on it. I remember taking that sucker home and putting it on my Fisher Price battery operated turntable and listen to it over and over again. I accidentally bumped it, and it made a scratching sound. Well needless to say I wanted to repeat that weird sound, so I started manipulating the record with my hand. I know for sure after I was done the 45 was toast and not playable. I might have even destroyed the Fisher Price record player. I guess to this day I’m still kind of doing the same thing I did back then finding weird sounds I like and manipulating and shaping them into my art. YK: I have to ask. What’s with all the mystery around your identity? MB: It’s intentional and also my artistic statement against all the attention grabbing people that are out there right now. It’s at a ridiculous level with the chase for fame. I’m trying to make who I am secondary to the art I make. Back in the day when you got a mixtape from a friend you didn’t care what the artist looked like or if they wore Versace or whatever. The only thing you had to go by was if you liked their music or not. Now this industry is the complete opposite. The artist can be horrible, but as long as they have a catchy hook on their song and a good video and a bunch of naked women they’re almost guaranteed to get attention. This drives me insane. I wanted to bring it back to basics. Lyrics, simplistic beats, and mad content! YK: Will you ever reveal your face? MB: I hope not. I’m not planning on getting arrested, but I hope if I ever do they let me keep my disguise on for the mug shots. YK: You clearly have an appreciation for Hip Hop history. When did you first get personally connected to the culture? MB: It was 1988. I was on a road trip with my moms who was hell-bent on making sure that I knew the outdoors as most Canadians do. You know fishing, swimming in lakes in the middle of nowhere, and canoe trips and such. She was torturing me with all her favorite music at the time which I have now come to appreciate and may even sample in the future. I think the road trip took like 9 hours, and she would keep playing the same stuff over and over again. We stopped for gas in the middle nowhere. When I say the middle of nowhere there was like a gas station, and I think a restaurant and nothing else. The kind of place where the locals talked about who had run into a moose the day before or if the RCMP had caught the bear that had broke into their neighbor’s house. It was your typical northern Canadian town. I walked into the gas station determined to fix the music situation. Back then there was no CDs, no MP3s. All you had was this metal stand that rotated and had all the cassette tapes pad locked in. I started spinning it around and then saw the cover of RUN-DMC’s Tougher Then Leather. Something happened for me the minute I saw that cover. It was so different then everything else on that cassette rack. It was simple, direct, and in your face. Needless to say, I spent no time getting the cashier to open up the pad lock so I could have it. I somehow managed to convinced my moms to buy it for me, and then somehow convinced her that it was time to share the cassette deck in the car for the rest of the trip. I think we came to an amicable solution. She would get an hour of her music then I would get an hour of mine. Well, when it came time for my hour I put the tape in and heard the crowd noise then the intro “We had. Say What” of the track “Run’s House“. That made the hair on the back of my neck stand up. Then the beat kicked in, and I was hooked. I wanted every part of whatever this was. Needless to say my moms wasn’t so instantly excited as I was about what was coming out the speakers. The funny part she’s now is my biggest fan! YK: How did the single “Sadat X Is Back” with Sadat X come together? MB: I wanted to make a contribution, in my small way, to the culture and trying to bring it back to its roots. I hadn’t listen to Sadat in years. Then for some reason I woke up one day and had a thirst to hear his Wild Cowboys album. I’ve always thought he has one of the best voices in the industry, and I have always appreciated the whole Brand Nubian crew. I connected with him on the net, and he was receptive to the idea and my production style. This project was initially only a single featuring him, but it’s sorta took on a life of its own and grew into what it is now. YK: Why did you select the particular artists you have featured on Dawn Of A New Day? MB: First, I’m a fan of all the people on this project. I think they are some of the most overlook, underappreciated emcees in the game. So I wanted to shine some light on them. Even the new artists like Paperboy Prince Of The Suburbs are amazing. He kind of reminded me of Biz Markie back in the day. Substantial’s content and delivery not many can touch. Que Billah is just a beast with his abstract thoughts and cadence. Trin is smooth as hell with her delivery and who in their right mind doesn’t like a female emcee. Then of course you have the obvious Rapper Big Pooh who can ride with the best of them, Wordsworth who is not to be mess with lyrically, and Scarub. There is a reason he was in a crew called Living Legends. Last but not least, Sadat X. Why do think he got the look on Biggie’s Born Again album with track “Come On”. Fun alleged fact here. That track was supposed to be released on Big’s Ready To Die album, but Puff cut it out for some reason at the last-minute. YK: You have female rapper Trin on the track “Summer Luv”. Back in the day you had a number of femcees that got just as much attention as their male counterparts. Why do you think there are so few females celebrated in Hip Hop right now? MB: This project wouldn’t be complete without a female emcee. I have this feeling that in the next couple of years you’re going to see a lot of really dope female producers and emcees emerge from their cocoons and take over the game. Prime example, look at 16-year-old Wonda Gurl from T Dot getting the look she did on Jay Z’s [Magna Carta Holy Grail] album. I think this may just be the tip of the iceberg. YK: Mainstream Hip Hop has turned away from focusing on lyrics the last several years. Do you feel with top-selling artists like Kendrick Lamar and J. Cole that lyricism is started to be somewhat recognized again on radio? MB: Things move in cycles. I think we’ve been in a little rut sonically and lyrically for a minute now. That was one of my reasons for putting this project together. Out of deep appreciation for the culture I wanted to help steer it back to its roots. I get exited when I hear J. Cole and cats like Kendrick, because to me that means that there is about 100 other dope artists coming up behind them that have the same mind-set. Don’t be surprised if a lot of the new artists that become big due to content and lyrics come from Canada and Europe as these places seem to have hung onto the complete culture more than the U.S. in the last couple years. YK: If you had to select three emcees that optimize supreme lyricism who would you pick? MB: Can’t do it in three. 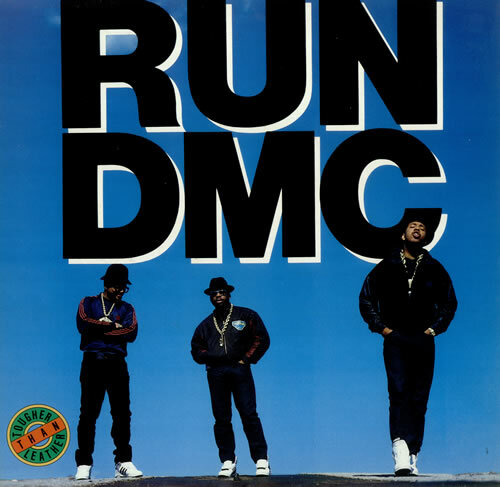 Here you go in no particular order: KRS-One, Supernatural, Grand Master Caz, Melle Mel, Big Daddy Kane, Yasiin Bey formally Mos Def, Common, Andre 3000, Big L, Rakim, Eminem, Guru, Nas, Biggie, and Jay Z.
YK: What has been your favorite remix you’ve created? MB: The one I’m working on now. It’s a house music remix for an R&B / Soul artist from Chicago / LA. His name is Andre DePriest, and the track is called “In This Life”. It should be a banger and come out in the fall. YK: Who are some of your inspirations as a producer? MB: Rick Rubin. The story I heard is that he was the first producer to put real song structure to Hip Hop, you know three 16’s [bars] and two hooks. Before this cats where just rhyming for like 15 minutes straight with no structure. If you listen to his sonics they are so simple, but they always work. Very few can do this simplistic production style and make it work. As a human this guy is just so original and humble. He is the one I’m modeling my career after the most. I’m kind of obsessed with this dude. Don’t be surprised if I flip it up and produce a country or hard-core rock record in the next couple of years. You can blame that on Rick’s influence. Organized Noize. A lot of people don’t know about these three guys. I guarantee that if you like Hip Hop you love some of their work. They have been sonically responsible for shaping OutKast, TLC, Ludacris, and Goodie Mob. Beside DJ Toomp, these cats are responsible for the Atlanta sound. I actually met Ray Murray, and he is one the most down to earth people I have ever met. Dude seemed like he was deep like roots of a tree. No ID. I also had the privilege of meeting him briefly. I respect his patience and that he does things on his own terms. Most people don’t know that there would be no Kanye West without No ID. Bangladesh. This cat is like an alien from another planet. His is so advanced that it took people a minute to catch up to his production style. Kanye West. All I’m going to say here is “FREAK OF NATURE”. Premo aka DJ Premier. If you don’t know about this guy. Then you don’t know Hip Hop. Pharrell Williams. I respect him on so many levels. His choices as a human being, his entrepreneurship, and uncompromising artist integrity. He kind of falls under the Rick Rubin category for me. Q-Tip. King of all sample loops!! Quincy Jones. Need I say more than Off The Wall and Thriller. Timbaland. He is also another freakin alien from another planet. 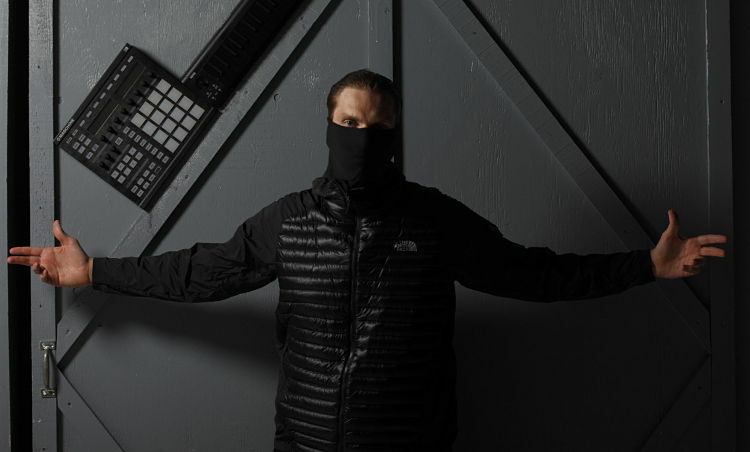 Hudson Mohawke. Crazy Scottish white boy. If I had to sum up his production style it would be: F*ck you, I’ll do it my way. YK: Outside of Hip Hop who are some other artists that get constant play on your playlist? MB: It changes so much and so often in this department, but right now I’m vibing out to Jessy Lanza’s “Kathy Lee”, Maverick Sabre’s “I Need”, Tragically Hip’s “New Orleans Is Sinking”, Van Morrison’s “Spanish Rose”, John Wayne’s “Call the Police”, Beenie Man’s “Wine to the Ground”, Red Rat’s “Bizzi Blazzi”, Hudson Mohawke’s “Twistclip Loop”, Eddie Kendricks’ “Goin Up in Smoke”, Bootsy Collins’ “Psychoticbumpschool”, Kao=S’ “Ogre of the Cherry Tree”, Johnny Cash’s “One Piece At A Time”, Mouse on Mars’ “Polaroyced”, Savages’ “Shut Up”, Mother Falcon’s “To Mama”. YK: What’s next for Maxwell Benson? MB: Right now some sleep!! Oh, I guess you mean projects. “Sadat X Is Back” animated video off Dawn Of A New Day EP coming out August 11th. “Don’t Test The Kid” animated video featuring Que Billah off Dawn Of A New Day EP coming out August 30th. “Spacestrunoght” animated video featuring Paper Boy Prince Of The Suburbs off Dawn Of A New Day EP coming out September 15th. R&B single from Andre DePriest out at the end of October. House music remix “In This Life” by Andre DePriest late fall. Dawn Of A New Day remixes around early 2014. Que Billah and Maxwell Benson mixtape. Paper Boy Prince of the Suburbs and Maxwell Benson mixtape. I can’t really say anything besides the fact that you will hear about a couple of things in the next year or so that are going to be game changers. Legacy project – Called Into The Wild. This one may take me 10 years. It’s an instrumental project that uses all the sound from nature to make the beats. I’ll have to go into the woods for weeks at a time to record all the sound of nature and shape them into dope instrumentals. I’ve been wanting to do this for a long time. I might even film the whole thing. 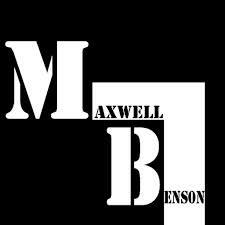 I’m always releasing random new stuff on my site and YouTube so join the email list at maxwellbenson.com/contact and you’ll get an email blast and free music.